Speaker: Michael S. Coffman, Ph,D. Dr. Michael Coffman, a friend, colleague and long time defender of private property rights died on June 21, 2017. Dr. Coffman was an author, researcher, speaker, and founding contributor to the fight against Agenda 21 Sustainable Development. Dr. Coffman was President of Environmental Perspectives, Inc. (EPI), and Executive Director of Sovereignty International. Dr. Coffman played a key role in stopping the ratification of the Convention on Biological Diversity (Biodiversity Treaty) in the U.S. Senate an hour before the Senate was scheduled to vote on its ratification. His maps and information have been used by local citizens across America to stop the global agenda at the local level. He has been a featured TV guest and a guest on numerous national radio shows. Dr. Coffman has.written several books, and has spoken to audiences in over 150 cities in America and Canada. He participated in several U.S. Senate committees and world conferences including United Nations meetings in Europe and Africa. As a scientist and writer, I have been fighting the global agenda that would destroy America as we know it for decades. As a researcher in the American paper industry, I ran a multimillion dollar research project on the effects of acid rain. When the results came in that it was basically a non-issue, I was told to quash my results or find a new job. That was when my eyes were opened to the fact that it was politics driving the science and not the other way around. 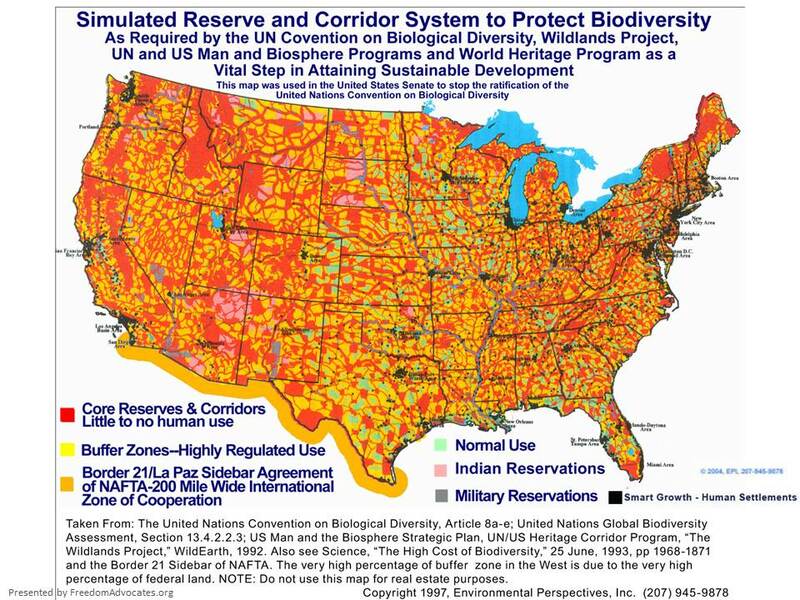 In 1994, myself and a few other individuals stopped the cloture vote to move forward to ratify the Convention on Biological Diversity Treaty which would have destroyed property rights in our country, thereby destroying free enterprise, the American way of life, and ultimately Freedom itself. That is the goal of the Globalists. It is not “saving the planet,” it’s not even redistribution of wealth ultimately. It is Control. Global control of everyone and everything. Together with my wife and all who have worked with us, both as colleagues and as fellow warriors in the fight for freedom, we have labored to inform citizens and policy makers, and to stop this agenda. To all of you who read this, I say this, Don’t give up. Keep fighting. Keep working. Keep doing whatever it is that God has called you to do. For me the fight is over. After a 2 ½ year battle with cancer, I am going Home. My time here is almost over. I thought I had more to do, but God is saying otherwise. Radio: What Will the Globalists Do Now? • Website: Sovereignty International, Inc.
• DVD: Global Warming? or Global Governance? Dr. Coffman uses powerful PowerPoint presentations to speak on subjects ranging from environmentalism, environment, ecosystem, biodiversity, global warming, climate, biodiversity, wildlands, treaties, geopolitics, globalism, the global agenda, conflict resolution, to smart growth and comprehensive planning. Dr. Coffman is currently President of Environmental Perspectives, Inc. (EPI), and Executive Director of Sovereignty International. EPI focuses on providing professional guidance and training in defining environmental problems and solutions based on Judeo-Christian principles of stewardship as contrasted with pantheism-based (nature is god) environmentalism. Sovereignty International helps many different organizations to bring a positive message of how national sovereignty, free market enterprise, private property rights, and traditional values are superior to the global treaties and agreements leading to global governance proposed by the United Nations in September, 2000. Dr. Coffman played a key role in stopping the ratification of the Convention on Biological Diversity (Biodiversity Treaty) in the U.S. Senate an hour before the Senate was scheduled to vote on its ratification. His maps and information have been used by local citizens across America to stop the global agenda at the local level. This includes two UN Biosphere Reserves and the designation of at least one river within the American Heritage Rivers Initiative. He has spoken to audiences in over 300 cities in America and Canada and has participated in United Nations meetings in Europe and Africa. Dr. Coffman has been a featured TV guest on the Outdoor Channel, C-Span and numerous national radio shows such as Marlin Maddoux's Point of View, the G. Gordon Liddy Show and others. He has written a definitive book that is highly recommended by several conservative members of Congress that exposes the pantheistic environmentalist phenomenon; Saviors of the Earth? The Politics and Religion of Environmentalism. His most recent book before Plundered is Rescuing A Broken America; Why America Is So Deeply Divided and How to Heal It Constitutionally. He has also produced many videos, the most significant of which are two documentaries, Global Warming or Global Governance and Global warming, Emerging Science and Understanding, which provides the overwhelming evidence for natural global warming and how man-caused global warming is promoted to create global governance.